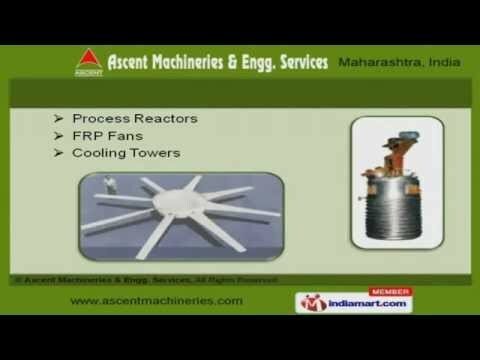 Welcome to Ascent Machineries and Engineering Services, Â Manufacturer and Exporter of Process Equipmentâs. The company was established in 1996 at Mumbai. We are a Member of MACCIA and EEPCI and we Cater to Chemical, Textile, Dairy and other industries. Alok Industries Limited and NPC Kremenco are some of our esteemed clients and we are backed by Cutting edge technology and competitive prices. Industrial Boilers, Vessels and Tanks are some of our products and services. Process Condensers, Industrial Equipments and Reboilers are best in the industry. Our FRP Fans, Process Reactors and Cooling Towers are in huge demand across the global markets. We present a unique range of Distillation Columns, Heat Exchangers and Effluent Treatment Plant Equipments at cost effective prices. Our organization is highly involved in providing an impeccable range of Pilot Plants, Vacuum Dryers and Hot Air Generators. Our Thermic Fluid Heaters and Piping Site Works are reckoned all over the world for their superb quality.